Plasmanex1 is a proprietary Bacillopeptidase F blend that supports circulation and may reduce PAI-1 to support the reduction of blood clots and may increase t-PA levels to break down clots faster and by decreasing blood viscosity by reducing fibrinogen. 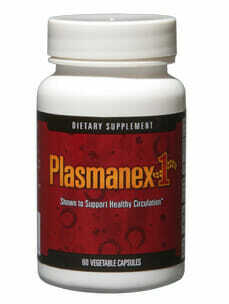 Plasmanex1™ is a dietary supplement shown to promote and support healthy blood circulation. The active ingredient of Plasmanex1™ is Bacillopeptidase F Proprietary Blend (BFPB). The Blend contains Bacillopeptidase F; a natural soy peptide enzyme extracted by using a patented fermentation production process. Blood circulates throughout the body to transport nutrients and oxygen to all the cells and carries away waste products. Without access to the blood, cells and body tissues are deprived of nutrients and oxygen and tend to die. Maintaining healthy blood circulation and keeping its components circulating efficiently is vital for the nutrient process and oxygenation. Healthy circulation in the vessels can help prevent blood clots. Disease states impacted by clots include heart attacks, cerebral infarction (stroke) and pulmonary thromboem-bolism (blood clots to the lung). Lifestyle factors such as obesity, aging, dehydration, pregnancy, cardiovascular disease and conditions acerbated by cancer, and long distance and frequent travel, are contributing factors to blood clot formation. Plasmanex1™ helps maintain and support optimum blood circulation. Research demonstrates that Plasmanex1™ helps support healthy blood circulation. Other Ingredients: Microcrystalline Cellulose, Hypromellose (vegetable capsule), Silicon Dioxide. Contains soy.